Australia is a land stripped of megafauna. The largest surviving kangaroo is a dwarf compared to the elephants, giraffes, rhinos, and hippos of Africa. 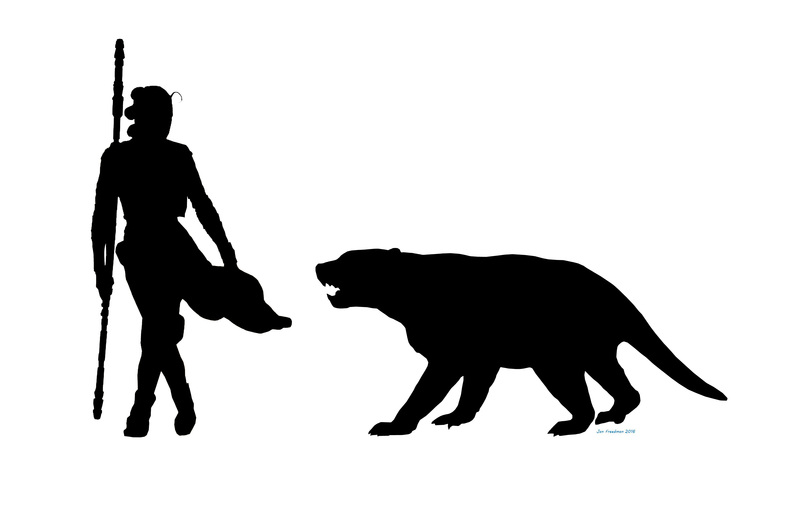 Similarly, the largest living carnivorous marsupial, the Tasmanian devil (Sarcophilus harisii), is a stunted furball when placed against the lions, tigers, hyenas and bears that frighten us in the old world. But, a quick look at the Devil’s lifestyle is enough to persuade us that perhaps this was not always the case. Tas is a scavenger by trade. Sniffing out carcasses and crunching bones. Who was producing the carcasses that allowed the Devil to fill the scavenging niche? The answer may lie with one of the most awesome carnivores to have ever lived: Thylacoleo carnifex, the marsupial lion. Make no mistake, Thylacoleo is a mysterious beast. When fossils of the animal were first found in New South Wales and sent to the infamous Richard Owen in London, even he was not entirely sure where the animal fitted. 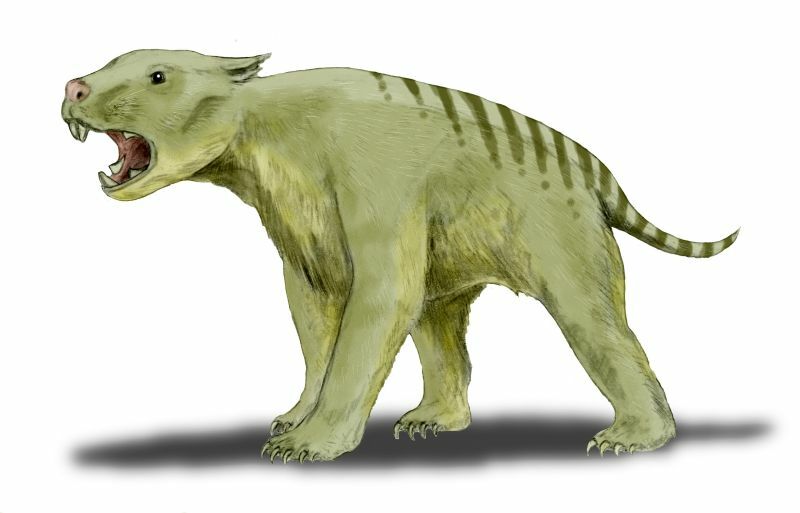 Additional material and close study eventually allowed scientists to place Thylacoleo into the diprotodontia (along with the extinct diprotodon, and the living wombats, koalas, and kangaroos). This affinity is reflected in the unique dentition of T.carnifex: it has two teeth at the front, but modified into Nosferatu-like prongs. More incredible yet are the molars. Many are familiar with the carnassial shearing that the battery of molars and premolars perform in placental carnivores, acting like a pair of scissors to slice through flesh. In Thylacoleo, this function is performed by just two teeth; massive and elongate, they extend along the mandible and maxilla to form a biological set of shears. 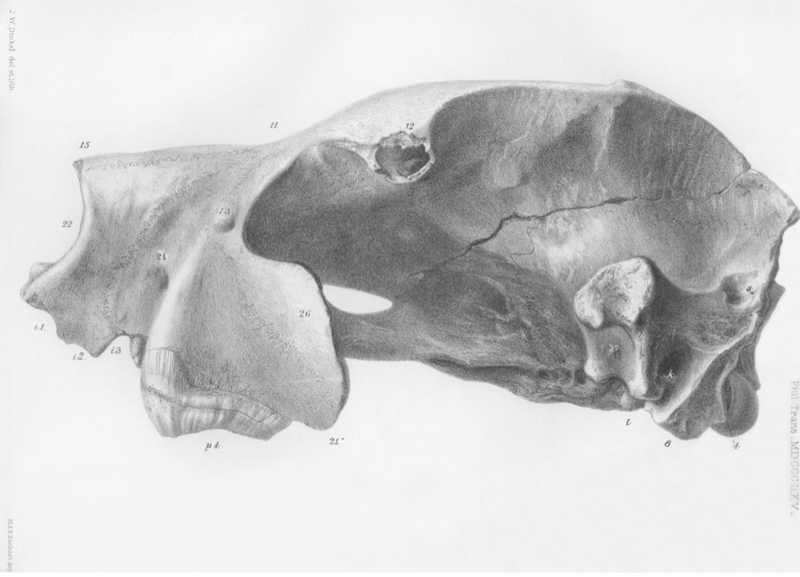 In fact, research on the skull of Thylacoleo suggest it may have had the strongest bite for its size of any carnivore known. Even the giant diprotodon may have been hunted! 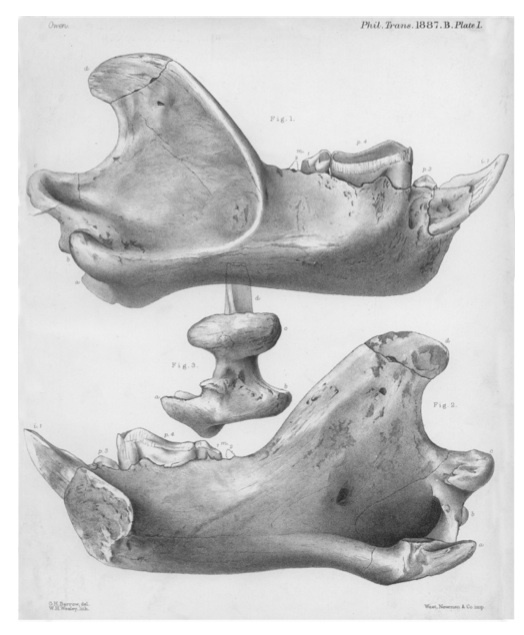 The mandible of Thylacoleo, showing the incredible shearing molar. We can see the damage the shearing molars did to prey in some fossils found at Lancefield swamp in Victoria. 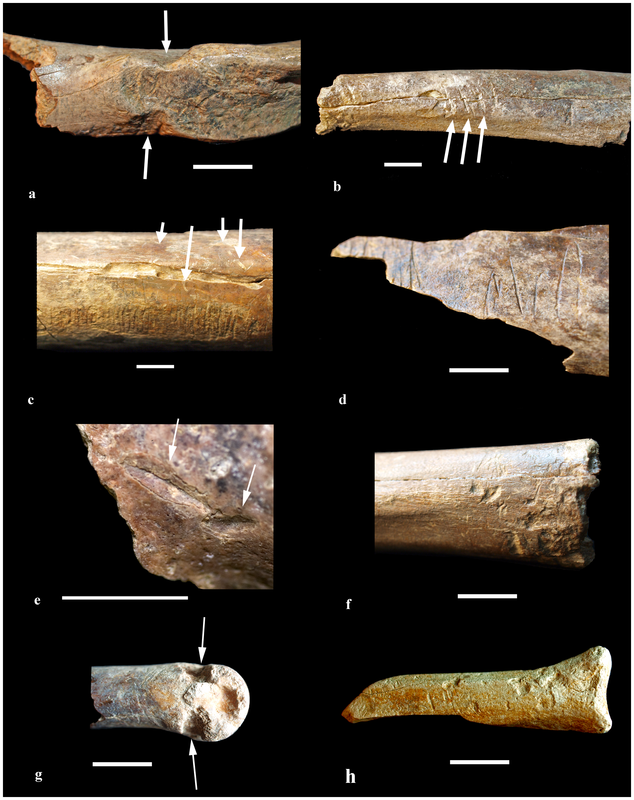 Initially interpreted as human cutmarks, reanalysis suggested that the paired and opposing cuts found on the bones were most parsimoniously explained by the action of upper and lower molars of the marsupial lion. These powerful teeth left tell-tale marks on both sides of the bones as they were chewed. Like modern-day cats it seems that Thylacoleo was not a bone cruncher and mainly ate muscle and flesh (leaving plenty of scraps for Tas). Also like the felids, T.carnifex appears to have evolved dextrous paws, with the killing tool an oversize thumb claw on the pes, which may have been hyper-mobile. The other claws might have been retractable too. Bitemarks caused by Thylacoleo on remains from a site in SE Australia. Images from Camens et al. These unusual (for a marsupial) features may have been emphasised in an enigmatic piece of cave art from Western Australia. The image, drawn with red ochre in a cave shelter along Admiralty gulf shows a large transversely striped animal. While the stripes would immediately suggest a Thylacine, other characters point towards an identity with the marsupial lion. The artist has made the creature look stocky, with massive forelimbs, completely unlike the lithe Tassie tiger. The paws of the animal have been emphasised with the hint of a large thumb claw. 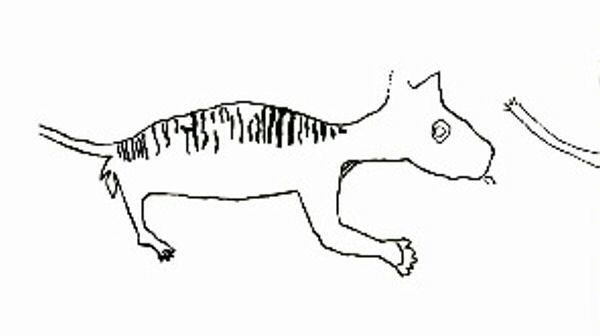 The head is square, with triangular ears, in contrast to the dog-like head and rounded ear of the Thylacine. I don’t know if the image represents Thylacoleo or Thylacinus. If the former it would suggest that a striped pelage evolved independently within the dasyuromorphia (the order that the Thylacine and Devil belong to) and the diprotodontia (the order that the marsupial lion belongs to). The unusual rock art claimed as Thylacoleo. Image from Ackerman and Willing. And what happened to the marsupial lion? Well, like the demise of the diprotodonts and Megalania, this is still a mystery. We know that humans first arrived in Australia around 46,000 years ago. When the megafauna disappeared is not clearly known, but seems to be soon after. Was Australia big enough to cope with two apex predators? Many doubt it. We know from bitter experience with the Thylacine that humans do not tolerate other predators. This entry was posted in Marsupial Lion and tagged Australia, Carnassials, Carnivores, cave art, Dasyuromorphia, Diprotodon optatum, Extinction, megafauna, Richard Owen, Sarcophilus harisii, Tasmanian Devil, Tasmanian tiger, Thylacine, Thylacinus cynocephalus, Thylacoleo. Bookmark the permalink.